Knitted Christmas ornaments to trim the tree are a knitting tradition in the Shenefield house; this is one of Pam’s favorites, taught to her years ago by her grandmother. It’s a quick and easy pattern to make a perfect Christmas stocking in miniature; lovely as a tree ornament or, marked individually in some way, ideal as gift tags or dinner table place cards. 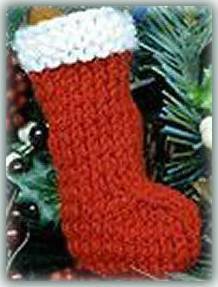 Size: Approximately 2″ wide x 4″ long (from top edge to base of heel). Row 1 (dividing row): K 13 (leave rem 7 sts unworked). Foot With right side facing you and using right-hand needle (with 7 sts at right-hand edge on it), join red and pick up 6 sts along right edge of instep, then knit across 6 instep sts, pick up 6 sts along left edge of instep, knit rem 7 sts (32 sts now on needle). Row 3: K2 tog; *K13, K2 tog; rep from * once more (29 sts). Row 5: K2 tog; K11, K2 tog; K12, K2 tog (26 sts). Row 7: K2 tog; *K10, K2 tog; rep from * once more (23 sts). Row 8: Purl. Bind off all sts in knit. Finish off red. Thread 20″ red sewing length (below cuff) into yarn needle and sew back and sole seam. Then thread 16″ white sewing length (at base of cuff) into yarn needle and sew seam on cuff. Do not finish off; make 1″ yarn loop at top of stocking and then fasten end securely. Weave in ends.